Summit® 180 is a premium synthetic roof underlayment designed to enhance the life of a roof through superior strength, water resistance and UV protection. Stronger and lighter than #30 felt underlayment, Summit® 180 synthetic roof underlayment is ideal for use in virtually all steep-slope roofs. Summit® 180 is constructed from an extremely strong polypropylene woven fabric that guards against mold growth, rot and water damage. Slip-resistant coatings make for superior walkability and a UV coating allows for 180-day exposure to the sun while the roof is being installed. The strength and durability of Summit® 180 synthetic roof underlayment will be undeniable year after year as your clients’ homes enjoy an added level of protection from water and mold growth. Learn and observe safe roofing practices according to OSHA and local building code requirements. Always use caution when walking on sloped roof decks and Summit® 180 underlayment. Do not walk on unsecured Summit® 180 or any other loose material lying on sloped roof decks. Dust, dew, water and debris create unsafe conditions on the roof. The presence of any foreign matter may drastically change the coefficient of friction (traction) on Summit® 180 or any other material on a sloped roof deck. Failure to always use proper safety equipment and footwear can result in serious injury or even death. Summit® 180 shall be applied to properly ventilated, building code approved roof decks. Before getting started, be sure the roof deck is clean, solid, properly fastened, and free of voids and/or damages. 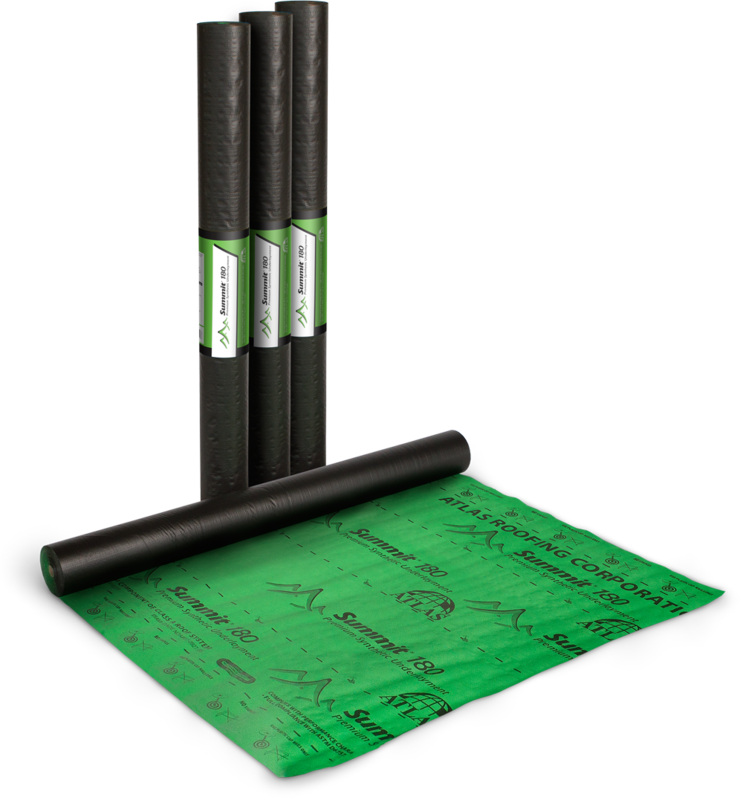 Begin by unrolling the underlayment from left to right, noting that the printed side should be facing up for installation. 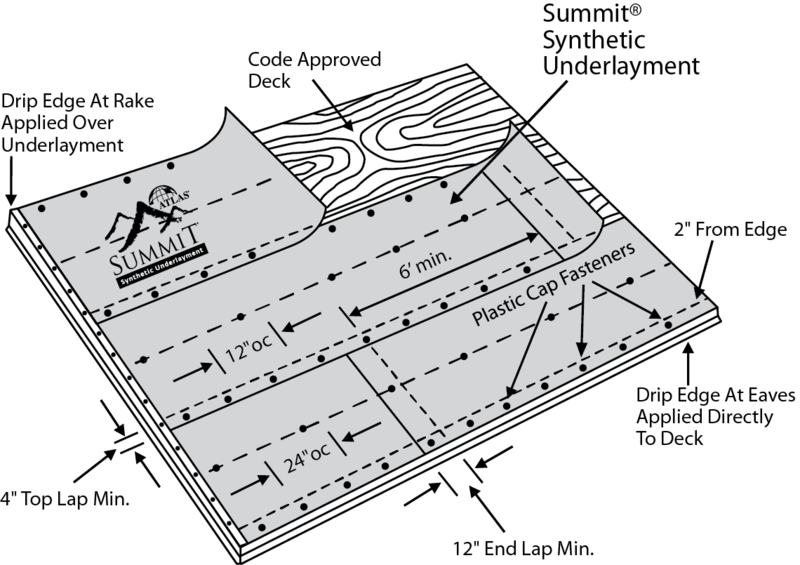 Plastic cap fasteners, with a 1" minimum length and 1" minimum cap diameter, must be used to secure Summit® 180 properly. To secure, follow along the indicated fastener placement lines at the top and bottom to space fasteners at 12" o.c. horizontally. Then, follow along the indicated center lines to space fasteners at 24" o.c. When more than one piece is required to continue a course, overlapping is necessary. The overlaps at the top and bottom should be a minimum of 4". The fasteners should be placed 2" in from the edge of the top and bottom laps. The end overlaps should be 12" minimum and fastened vertically at 12" o.c., staying 2" in from the end of the top layer. The plastic cap fasteners should be driven tightly into the surface of the Summit® 180, being careful not to cut into the sheet. If any damage to Summit® 180 occurs, it must be repaired before continuing on to the next step. Atlas WRB peel and stick flashing tape (or equivalent) can be used to repair seams, joints, and tears. Asphalt adhesives may be used at this point to supplementally seal joints, flashings, and laps. For best results, Summit® 180 should be extended at least 12" past all hips and valleys. If Summit® 180 is being installed on decks with less than 4:12 slopes, it should be applied in a double coverage method. Here, the overlap of each installed course should be 24", rather than the normal 4". It is acceptable to drive the fasteners through both layers to secure. Always follow the ARMA (Asphalt Roof Manufacturing Assn.) 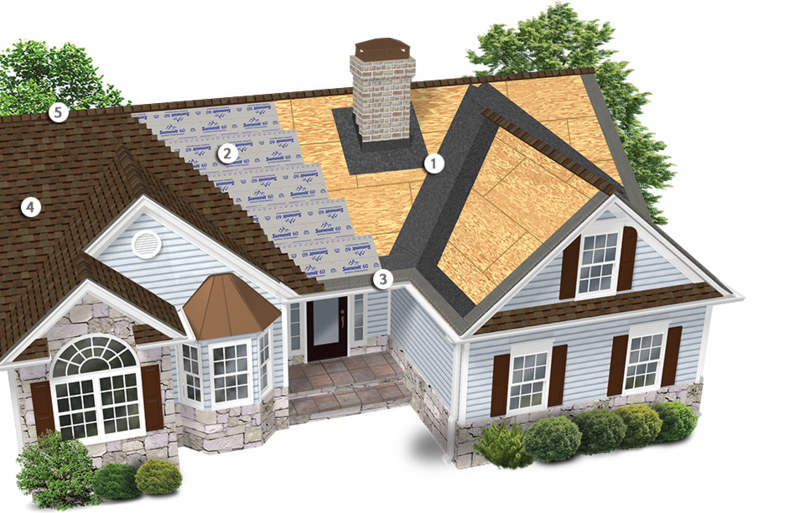 recommendations for installing shingle underlayments and flashings for best roofing practices. Note: If local building code or jurisdiction requires the use of metal cap fasteners in lieu of plastic cap fasteners, clear latex sealant must be added to the underside of every metal cap and nail head if the roof needs to be kept watertight during installation. Examples where complete water tightness may not be a primary concern are new construction with unfinished interiors or re-roofing applications where the final roof covering is installed immediately. Product tears, leaks, or any other product performance issues due to the use of metal/tin cap fasteners is not covered under the product warranty.